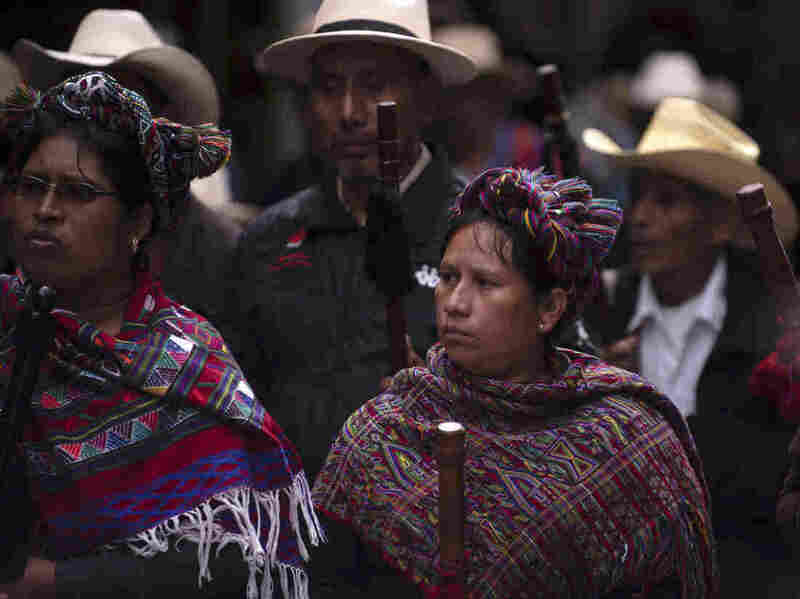 Killings Of Guatemala's Indigenous Activists Raise Specter Of Human Rights Crisis Indigenous groups and human rights activists worry that the violence that raged through their communities in the 1970s and 1980s is making a comeback. Mayan indigenous people protest against the government of Guatemalan President Jimmy Morales on the day he gives an address to Congress in Guatemala City, Monday. Indigenous citizens, many dressed in colorful traditional clothing, came out partly to protest the Guatemalan president's recent expulsion of a United Nations-backed commission investigating corruption in the country. Since 2007, the International Commission against Impunity in Guatemala, known by its Spanish initials CICIG and funded by the U.N., the United States and the European Union, has worked with Guatemalan justice agencies to target corrupt officials. In the highly unequal society that is Guatemala, many Maya believe any strengthening of the justice system will protect indigenous rights granted under the country's constitution and peace accords. The country's indigenous people therefore have a strong motivation to lobby for the rule of law. Maya communities bore the brunt of almost four decades of a civil war that ended in 1996, leaving over 200,000 casualties, the majority indigenous Guatemalans, according to the United Nations. Now the mostly Maya organizations and many human rights groups worry that the violence is making a comeback: In just the last year, 26 members of mostly indigenous campesino organizations have been killed. "Guatemala is on the verge of a major human rights catastrophe," says Jo-Marie Burt, a professor at George Mason University in Fairfax, Va., and a senior fellow at the Washington Office on Latin America, an independent research and advocacy center. According to Burt, the Guatemalan Union of Human Rights Defenders has tallied over 200 attacks against human rights defenders in Guatemala in the last year. Guatemala is on the verge of a major human rights catastrophe. Burt believes Guatemala is close to falling into the violence that gripped the country 30 years ago, which the United Nations and some Guatemala courts say led to a genocide of the country's indigenous citizens. One of the killings took place in July, in the province of Quiché, one of the areas hardest hit by the civil war. A 25-year-old Ixil Maya nurse, Juana Raymundo, was delivering paperwork related to her job as a community health worker near the city of Nebaj. Her father told Guatevisión TV that she called to say she'd be home after that errand, but they never heard from her again. "She was kidnapped," he says, "and we had no other word from her." Her body was found days later, showing signs of torture, in a river covered by brush. To many in the area, her death was reminiscent of the massive atrocities committed during the long civil conflict. According to numerous media articles, Raymundo was a rising young political leader, active in various indigenous and human rights organizations. She had been recently elected to head an indigenous civic committee with plans to become a political party. Hundreds attended her wake and funeral, where a leader of the Campesino Development Committee said the organization would not be intimidated. Indigenous, human rights and international organizations expressed outrage for Raymundo's murder. Indigenous scholar and commentator Irma Alicia Velásquez Nimatuj wrote in her column in the newspaper El Periódico, "After having lived through a genocide, we should have learned the lesson that no one in Guatemala, regardless of ethnicity, gender or class, should be killed for thinking differently ... or for dreaming of a different future." 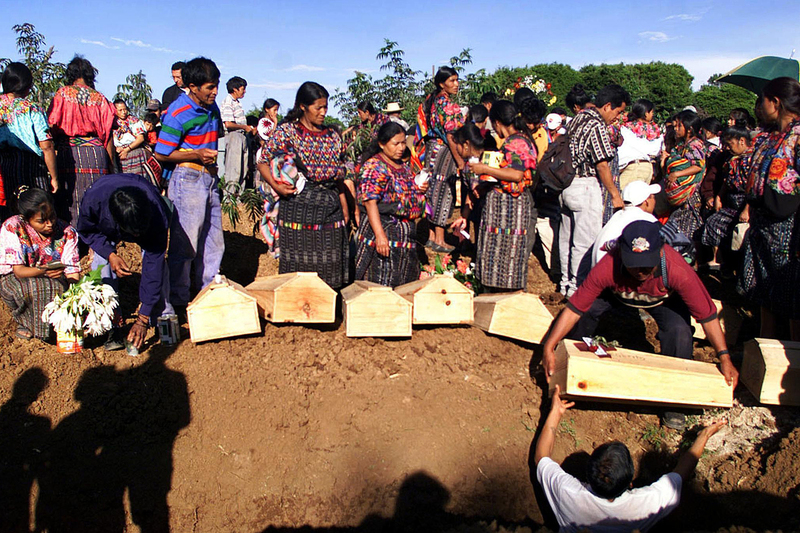 A group of indigenous Mayans bury the remains of 28 people in 2001 in Chiche, Guatemala. The victims were killed by military and paramilitary forces over a period of two decades during the governments of Generals Efrain Rios Montt and Romeo Lucas. According to Velásquez, Guatemala has entered "a new stage of repression" — one focused on "assassinating community leaders who defend their territories from invasion by transnational companies bent on depriving indigenous peoples of the resources they have in the soil and the subsoil." Numerous conflicts over land and mineral rights have surfaced in indigenous communities throughout Guatemala. Guatemala's human rights ombudsman Jordán Rodas told NPR that as the number of killings reached alarming proportions — nearly 20 last summer — he attempted to set up a meeting between the heads of indigenous groups and members of the administration of President Jimmy Morales. "They refused to meet with the indigenous leaders," said Rodas. "One feels a certain indignation that there's no public condemnation of these acts. ... I don't have much faith in this government ... hopefully the Justice Department will take action on these cases and find the intellectual authors find who was behind [the attacks] ... because it's like going back to a past I had thought we had overcome." On Aug. 5, shortly after Raymundo's killing, the respected sociologist Edelberto Torres-Rivas provided historical context for the attacks on rural leaders in a long opinion piece for El Periódico. "Campesinos have always been manual labor and cannon fodder," Torres-Rivas wrote. He went on to warn that "In Guatemala there is a return of those who've carried out crimes in the recent past ... and if the authorities don't take care ... there could be a reaction." Meanwhile, Burt warns that the U.S. public should also be concerned about the situation in Guatemala: "It literally feels like it's on the edge of the precipice and just over that precipice, you're staring back at [in] the 1970s ... and you're staring at [a] massive violation of human rights." "It's no surprise," she adds, "that we see ... tens of thousands of Guatemalans fleeing the country going into Mexico trying to get to the United States to flee a country that is in free-fall — where there are no guarantees and there is no security."